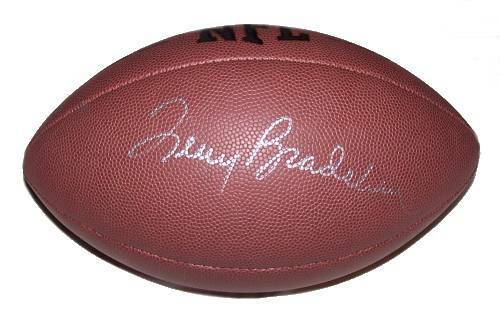 A Wilson NFL football signed by former Pittsburgh Steeler quarterback Terry Bradshaw. Comes with a Certificate of Authenticity. Terry Bradshaw is a former American football quarterback with the Pittsburgh Steelers in the NFL. He played 14 seasons. He is a football analyst and co-host of Fox NFL Sunday. In a six-year span, he won four Super Bowl titles with Pittsburgh (1974, 1975, 1978 and 1979), becoming the first quarterback to do so, and led the Steelers to eight AFC Central championships. He was inducted into the Pro Football Hall of Fame in 1989, his first year of eligibility ~ Wikipedia.